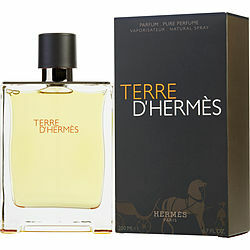 Terre d'Hermes parfum for men does the job with dignity, elegance, and discretion. TERRIBLE DE HERMES: SMELLS LIKE SOMETHING MY GRANDMA WOULD WEAR! FOR REAL! Terre ‘d Hermès; A perfume like no other. It lingers on for over 12 hrs. I’ve been using it for years and there’s no day people don’t ask me what cologne I was wearing. When I went for a job interview years ago, i was told that I changed the atmosphere of the room seconds after I went in. This cologne is the best of the best. Don’t attend any occasions without it. Irorere, E.
I can't tell you how many times total strangers have asked me what I'M wearing. 100% women. I can't smell it but the ladies do. Big time.